The iPhone X is sure to be a hot seller this holiday season. You probably know someone with the $1,000 iPhone on their wishlist, and with a price tag that high, Black Friday is probably the best chance of them getting one. But there's only one store we've found so far that's even offering a real holiday deal for the iPhone X.
Walmart appears to be the only major retailer at this time to promote some kind of Black Friday special for Apple's iPhone X. That's weird, but what's even weirder is that the company doesn't even seem to be pushing the deal in any meaningful way. 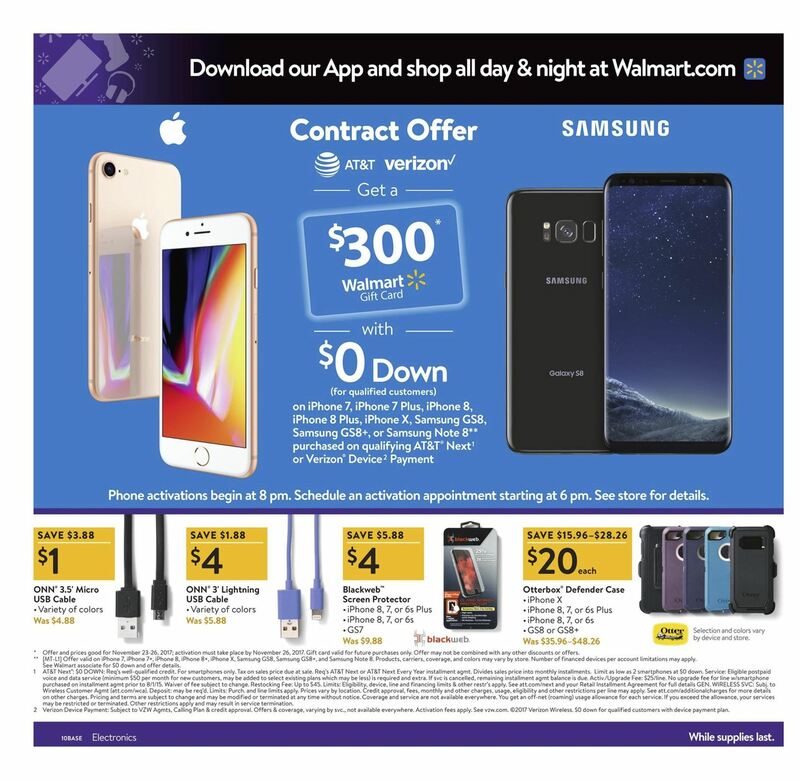 If you look at Walmart's Black Friday circular, it's clear — get a $300 Walmart gift card with the purchase of a qualifying iPhone and a contract with either AT&T or Verizon Wireless. Seems fair enough. However, Walmart uses an image of the iPhone 8 to advertise the deal instead of the hot ticket item everybody wants. When you read the small print beside the iPhone 8 image, it's clear that the iPhone X is most definitely included in this Black Friday sale. It's also at the bottom in the fine print, but it's not even listed first in any of these places. Walmart lists the iPhone 7, 7 Plus, 8, and 8 Plus before finally mentioning the X. What gives? You'd expect Walmart to put the iPhone X front and center since it's the hottest smartphone right now. Apple even does exactly that on its site. It might not seem so strange if it weren't the only iPhone X deal during Black Friday. Does Apple have something to do with this, or was it just a marketing person going in alphabetical order? Maybe there is a limited supply of iPhone X models, which could also explain why Walmart is the only one right now with a sweet deal. Who knows, but it sure beats the lame trade-in deals carriers like Verizon and T-Mobile are offering right now. While you're not getting the iPhone X $300 cheaper at Walmart, you are getting a chance to buy $300 worth of iPhone X accessories at Walmart later (or, you know, groceries or something). This deal goes from Nov. 23 to Nov. 26, and activation with AT&T (on the Next plan) or Verizon (on Device Payment plan) must take place before Nov. 26. So apparently the iPhone X wasn't available online at midnight last night or at the store during their Thanksgiving Day 6pm "sale". So much hype only to disappoint; but I guess I've come to expect this from WalMart.